We are proud to have Me Too join the Little Boy Chic family of brands. 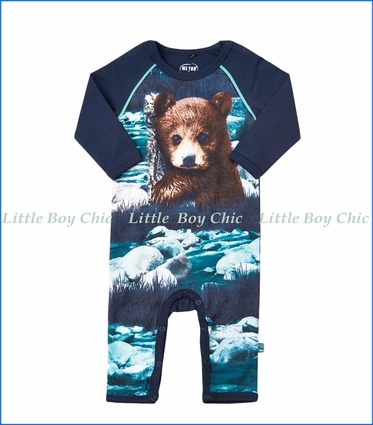 Their vibrant designs are evidenced in this striking one-piece romper featuring a design of a bear frolicking in a stream. Raglan long sleeves. Super soft feel from organic cotton, and a bit of stretch for fit and comfort. Easy snap button closure on the front and legs.